Horace Ridler was dealt a life of privilege, but he didn’t want to play that hand. Instead, he created a persona that was the total antithesis of his background. Ridler was born in Surrey, England to a wealthy family. Growing up, he enjoyed all the privileges of education and travel such a life affords. At the outbreak of World War I, he heeded the bugle call and served in the British Army, attaining the rank of major. In 1922, Ridler left military service and needed a job. This is where his life parted ways with the conventional. After being a member of the rank and file, he wanted something that would let him stand out a little bit. The most promising prospect for him was the business of show. He started getting pictorial tattoos and displayed his body art at small sideshows. Unfortunately, this didn’t turn out to be as profitable as he had hoped. Ridler decided that in order to earn more, he’d have to give the audience more. In 1927 he started working with famed tattoo artist George Burchett who helped Ridler design a custom, whole-body look. After 150 hours under the needle, Ridler was sporting full-body, zebra-like stripes that even covered his other tattoos. Through the physical transformation, Ridler created a character: The Great Omi. He toured England and France but felt that the tattoos alone weren’t interesting enough to sustain audiences. He amped up his look by piercing and stretching his ears with large-gauge jewelry, piercing his septum, and filing his teeth to a sharp point. To add entertainment value, Ridler created an elaborate explanation for his tattoos saying he was captured and tortured by natives in New Guinea. His wife Gladys, who changed her name to Omette, got in on the act by describing Omi’s African ordeal as she introduced him. 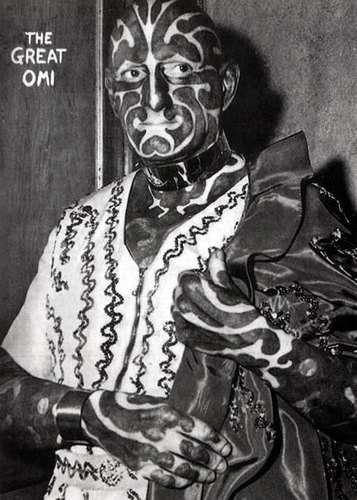 Ridler’s fame as Omi crossed the pond, and in 1939 The Great Omi appeared in the sideshow at the World’s Fair in Queens, New York. When the fair closed, Robert Ripley hired him as the headliner in the Ripley’s Odditorium Theater. During Ridler’s six month run, he appeared over 1,600 times, often doing ten shows a day. World War II brought out the patriotic in Ridler, and he tried to re-enlist in the British Army. He was rejected, however, because his appearance was considered inappropriate for a soldier. Back in England he served his country by giving free performances to soldiers and charity organizations and using his fame to sell war bonds. QUESTION: Do you do anything to change your appearance (makeup, hair color, etc.)? If you were to get a tattoo, what design would you choose?